At night do you use the nose landing light to taxi as well as the taxi/recog? In P3Dv4 seems to illuminate the taxiway a little better. At the main terminals like DTW, the aircraft arrive at the gate with the APU running, and it remains on for a few minutes after engine shutdown - but once ground power is plugged in, the APU is shut down. Many large airports (especially in Europe) have regulatory restrictions on how long APUs can be run on a ramp because of concerns about noise and air pollution. I rarely see ground air conditioning connected to CRJs. On a warm day, flight attendants will usually ask arriving passengers to close their window shades before deplaning to help keep the cabin from heating up. The only airport where I have seen ground air used on CRJs on a regular basis is Houston, where afternoon temperatures at this time of year are often in the mid 90s (F). At outstations like my home airport KELM, the APU is usually kept running. These flights, (to and from DTW) are "quick turns" - unload the incoming pax and bags, then immediately board the next group of outgoing passengers. Often, the pilots never even leave the flight deck, except to do a quick walk-around inspection. The exception is the last two flights of the day, which arrive in the evening and remain overnight . They plug into external power and shut down the APU. Many airline CRJs are set up so that external power can be used just to power the cabin lights, with everything in the cockpit shut down. In fact, I believe that the pilots close and lock the flight deck door before departing for their overnight hotel. After passengers and crew leave, aircraft cleaners arrive to vacuum and tidy up the cabin, then kill external power when they are done. At my outfit we leave the App running between turns. Just like you said the shades are close during the summer times and that of course is done by the flight attendants because of heat. If it's an overnight we do leave the external power connected so we can get the plane clean off if maintenance is going to show up later on. If we do write up the plane we just leave it there and they take it from us. Quite frequently i use to travel between GCRR and GCLP, mainly with BINTER Canarias´ CRJ900/K and they always perform a single engine taxi untill they approach the runway, so i´d like to know how you do it (APU/Bleed-wise), which engine to use for taxiing and if there´s a special procedure/checklist for it. I guess it´s Company SOP dependant but just to get a slight idea on how to do it, as i couldn´t find anything related in the provided documentation. We go out single engine (Right Engine On) with the APU on. Left in Auto, the system will use the APU as the primary bleed source if the APU is running. Once we start the Left Engine, we shutdown the APU. The Bleed Valves switch stays in Auto the entire time. We run the right engine for single engine taxi because the outboard brakes are on Hydraulic system 2, so with the engine driven pump powered you can leave all four hydraulic switches on the overhead in Auto. Alternatively you can start the left engine and turn the far right (Hyd sys 2) to ON and you'll get full brakes. Inboard and outboard. Oh, I thought someone had asked this already, but looking through the thread I guess my memory was wrong. Are bleeds / packs off takeoffs performed often? If so...what does that process actually look like (do you turn the bleed dial thing to closed....or just turn the packs off, or something else?) In that case would you use the APU to supply bleed air for the packs during the takeoff in that case? Very rare. I've done 2 in ~800 hours of time in the CRJ900. It is very simple. You don't touch any of the bleed controls. Just leave the APU running. That's is. That´s exactly what i wanted to know, very informative, thanks a lot ! How often are flaps 8 used for takeoff vs flaps 20? Is the primary consideration runway length? Do you always use flaps 45 for landings? Or are lower flaps settings used at times? Where I am, takeoff flaps are decided by the company and our ACARS/Flight release data just tells us which setting we are usuing. But more often than not in the 700/900 it seems to be flaps 8. For landing flaps we use flaps 45 every time. This is a hugely useful thread. I have never conquered a really accurate descent in the CRJ. I agree the Speed Mode descent is steep and inaccurate, or if one does use the throttle, then it is much the same as a VS descent which is more accurate. I tend to use the Dir Intc information and VS to get me to the lowest key altitude that I want... is this ok? I skip the angles between waypoints unless the altitude is mandatory. But I fear it will be some time before I get a smooth continuous descent, if ever (sigh). But this real world advice is exactly what I have been seeking, Thank you all. I made such a hash of an approach into Lyon LFLL in the CRJ that I re-flew the exercise in a 737-600. The Boeing was spot on accurate, but the CRJ is more challenging by a country mile. 1. In my FCOM the first flight of the das flow and check is followed by the turnaround flow and check. But where do I start, when I already performed a flight on that day? I‘d say the shutdown flow and check completes flight 1 and the turnaround check and flow starts flight no 2, is that correct? 2. The hole chapter normal operations doesn‘t say to check the GPWS, why is that so? Depending on what operator FCOM you have, checklist can have different names. For example, our checklist does not have any 'turnaround check'. But, if we just completed a flight, haven't left the plane unattended, we pick it right back up at the "Before Start Checklist" that has items like PASS SIGNS, landing elevation etc. The GPWS is more or less self regulating. If any problems are detected with the basic modes an EICAS message will show up. You can still trigger a manual test if you want though. thanks for your reply, very much appreciated! The manual I have is from mesaba for the CRJ 900 (found it on google). The „turnaround checklist“ contains items like briefing, pressurization, fms & acars, efis, fuel etc. Interesting that the procedures are so much different from operator to operator. Another question: I‘m still trying to figure out the purpose of the XFR-switch of the mcp, is it correct to say, that by pressing the switch the autopilot uses the FO FD as source? 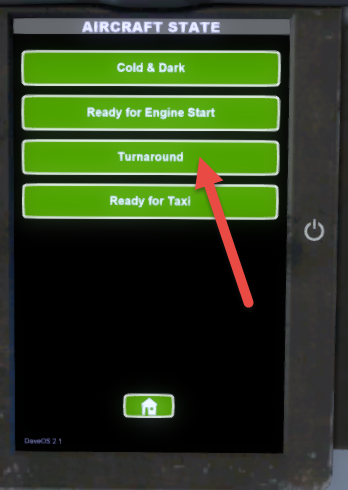 That turnaround check sounds similar to what my operator calls the Before Start Check. Ours has pass signs, landing elevation, nosewheel steering, altimeter setting, FMS, IRS, radios/nav aid setup and departure briefing. The XFR switch; Yes, it will basically between CPT/FO side instruments. In real life, this might result in slight altitude differences for example, or on aircraft not equipped with IRS but AHRS it can lead to differences in heading even. We XFR whenever we switch pilot flying for a sector, though not always if we temporarily switch roles during flight (crew meal, performing a briefing, toilet break etc). Does ATC always direct you around thunderstorm/convection areas as you're flying? Or, if your aircraft is equipped with radar, do you use that to make a heading change to avoid the storms? A lot of times ATC will let you know of any weather along your route as you get closer and let you know what planes ahead of been doing in terms of deviations. We also use ACARS to contact dispatch, weather radar on board and visual cues as much as we can to determine what may the best option for us.